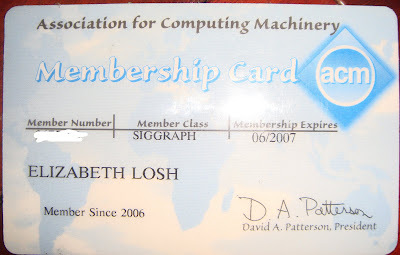 Above, you can see my ACM card, which represents one of my professional affiliations. I also have one for the Modern Language Association. In fact, I'm a member of so many professional associations as a result of doing research on digital culture that I don't even list them on my c.v. any more, for fear of confusing committee members. I think it's emblematic of how interdisciplinarity happens at the level of the practices of everyday life. I handed out copies of Siva Vaidhyanathan's Critical Information Studies: A Bibliographic Manifesto and made a plug for the new interdisciplinary UCI Design Alliance. I also thought about my own experiences as a graduate student and person potentially on the job market and shared six principles for interdisciplinary research. 1. Write well: When you step outside your discipline, what you will be judged by is your writing, and you have to revise rigorously in order to make it through blind peer reviews. This is also the key to having your work reach a wider audience so that people in those disciplines will be interested in your work. 2. Try and try again: Academia is all about persistence in the fact of rejection, particularly rejection of new ideas. You will certainly be rejected by people in your own discipline, so why take it too hard when it happens in another one? 3. Listen to the cultural conversation: On the other hand, there are places that will never accept your work until you become more attentive to their genres and the norms about research that they promulgate. Look at papers from people within that discipline and go to conferences to hear what's being talked about. In choosing conferences, think about trade-offs. A major international conference may be pricey, but it may give you the big picture very efficiently. A local conference may give you the opportunity to follow-up with face-to-face collaborations. 4. Know your limits: For example, I find submitting to social science journals too far out of my ken. It's important to know the ways of thinking in which it is hard to translate your ideas. 5. Be willing to retrain: You may want to build skills, such as those in new media production for example. Sometimes it is necessary to do this outside of your university, so consider it an opportunity to try out things in a safe zone away from your colleagues. 6. Keep a moral center: As Mark Warschauer said, interdisciplinarity is about understanding the world. It is not about virtuoso performances or strategies for academic display. There should be a reason that you are pursuing this research that has to do with a public policy issue, area of basic knowledge, or mode of artistic expression that allows you not only to understand the world but change it. On my list, it seemed like there was the most anxiety about the effective writing principle, particularly for international graduate students who are doing advanced study in the United States. Many of them asked about campus resources for help in this area. Afterwards, I peeked at the blogs of attendees Silvia Lindtner and Eric Baumer and -- based on what I saw -- I would say that there is also a very positive interest in public writing in the group I met. I particularly liked Eric's meditation on what a specialist in Informatics should call him or herself: informaticist or informatician?